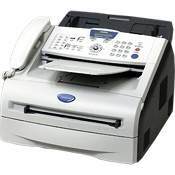 The IntelliFAX-2820 is a generation fax machine, using plain-paper Laser print technology to deliver a multifunction home and office tool that can be used independently or by connection with a PC or Macintosh computer. It boasts a large Memory capacity of 8MB, which stores up to 500 pages for out-of-paper reception and memory transmission applications. Enjoy faster copying at up to 15 cpm, expanded Broadcasting and auto-dialing capabilities, and a higher toner cartridge yield. The IntelliFAX-2820 also includes a built-in full speed USB interface, positioning it to take on future printing jobs if a customer needs to add this function. It uses TN350 toner cartridge and DR350 drum cartridge (sample toner is included).